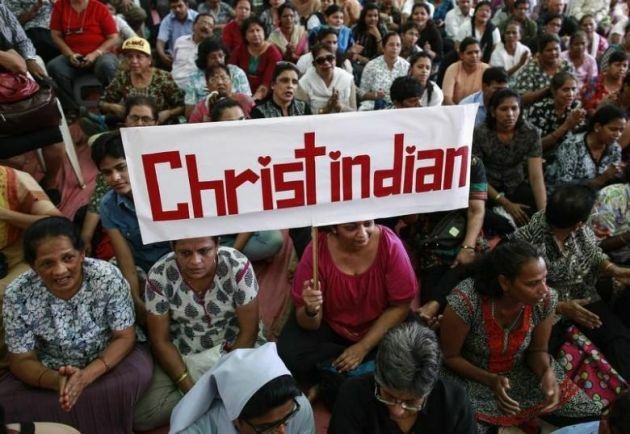 (REUTERS/ Danish Siddiqui)Christians in India protest attacks on churches. Protesters waved flags and chanted as India Prime Minister Narendra Modi arrived at the White House for a meeting with President Donald Trump who says he is a champion of religious freedom after evangelical Christians helped propel him to power. "We're here today basically to raise awareness of the human rights violations that are happening with India," Jatinder Grewal, director of Sikhs for Justice told CBN News on June 27. In recent years under Modi's rule, conditions for Sikhs, Muslims, Christians and other religious minorities have grown difficult and many accuse his Bharatiya Janata Party (BJP) of having a blatantly Hindu nationalist agenda. "When Modi came into power in 2014 he promised the Christians and other minorities that he would allow freedom of religion, he lied," said Pastor Rob Rotola, who also protested outside the White House to CBN, a Christian news agency. "The only people that have favored status in India is not all people; it's the Hindu nationalist," he said. "It's the far extremist party that tends to violence. And as these groups have ramped up the violence, the police state and the government looks the other way, and is allowing it to happen." "I am here to speak for the Indian church," said Bishop John Lutembeka, a missionary in India, "the Indians who are being persecuted by Prime Minister Modi, by a group of radical Hindus." "Christians have been killed, women have been raped and Hindu is taking more part in India and it wants to turn India into a Hindu nation and this is what has brought us here to protest," he continued. The protestors wanted, "to show that world that even the conversation that President Trump will have with Prime Minister Modi should put into consideration that tolerance of different religious. Let not one Hindu religion be over other religions and begin to persecute them." Christianity is India's third-largest religion after Hinduism and Islam according to the 2011 census, with approximately 27.8 million followers, constituting 2.3 percent of India's population. Christianity was introduced to India by Thomas the Apostle, who visited Muziris in Kerala in AD 52. David Curry, an opinion contributor to The Hill had written on June 24, "As Indian Prime Minister Narendra Modi is scheduled to meet with President Trump this week, a question is looming: what will President Trump say about the rise in brutal persecution of Christians, Muslims and other religious minorities in India? "Can we expect the President to bring this issue to light, or let it linger in the shadows? "Having recently returned from India, I witnessed firsthand accounts of pastors imprisoned and churches attacked by mobs of Hindu radicals, not to mention the abysmal saga of Compassion International, wherein the Indian government's crackdown - on this and other organizations - has led to tens of thousands of children throughout India losing access to medical care, meals and tuition." Curry is the president and CEO of Open Doors USA, a global advocate for persecuted Christians that works in the most restrictive and oppressive countries around the world. He said that Trump has an opportunity to diminish the worsening plight of persecuted Christians and those belonging to other faiths around the world - but that the window would not stay open forever. "We are hearing some great words on religious freedom from this administration. Now we need to see some action." CBN reported that White House officials have said the president likes to deal with delicate matters like human rights and religious liberty violations in private when speaking to world leaders. However, it's unclear if the president raised any concerns during his meetings with Modi. Modi arrived on the south side of the White House, the protestors were on the north side so it's also unclear if he ever saw them said CBN. The president said the U.S. and India "agree on most things" and joked that "by the end of the day we'll agree on everything. I have a feeling". He said India has agreed to partner with the U.S. in the fight against radical Islamic terrorism. India is also purchasing $365 million worth of military transport aircraft with another $2 billion sale of U.S. made unarmed drones to be finalized soon. Trump passed an executive order on May 4 making it easier for churches to dabble in politics keeping faith with his promise to evangelical Christians who helped him win the White House, but it could end up benefiting his opponents as well, Reuters news agency reported. Leaders of the U.S. religious left, a rising force of opposition to Trump's tough stance on immigration and healthcare, said they were poised to benefit from the move, which lifts the risk of religious groups losing their tax-exempt status if they advocate for particular candidates.